So I'm always making lists, and I started one while watching TV recently of commercials I hate. Thought about making it into a regular feature - since b*tching and moaning are the name of my game. So we'll see. Then I saw this ad on my AOL login screen and thought it deserved a place on the list too. Since it's the week of Valentine's (and why the ad was up in the first place), I thought I'd blog it. 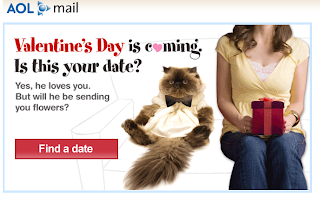 And the reason I hate this ad is NOT because of the sniffle-inducing cat in a weird, non-natural position. It's the fact that Valentine's Day should be a deadline or something for getting a date. I hate, hate, hate it. I can handle the commercialism - God knows our economy needs it - but it's ... implying that a woman's worth is defined, at least on this one day, on whether she has a date WHO WILL SEND HER FLOWERS. Give me a break. Flowers die, which is beside the point. I just think there are more appropriate ways to promote/advertise an online dating service.